Let’s cut the chase and start with the definition of SEO strategy for ecommerce site which directly puts it as a great advertising solution to get high quality customers. This simple statement basically renders this entire article useless after the definition of SEO strategy for ecommerce has clearly linked SEO and content as both a requirement for great advertising to get customers. SEO has become a game changer in ecommerce marketing. It wasn’t a few years ago but trends have changed and now if you do not have a good content against your product, search engines will not recommend you to researchers which means you are missing out on clicks. For a blog site, no clicks is end of story right there. But when you have a site that sells products, no clicks means no sales. Let’s understand search engines’ mind set for content first. Search engines today want to give their users a perfect search experience. Apart from giving the closest research to what they are looking for, search engines focus on giving the most relevant researches which gives their users more information for what is asked. This means that search engines only work around optimized content. If you have a good optimized content backed up against your product, search engines will gladly put you on first result pages. 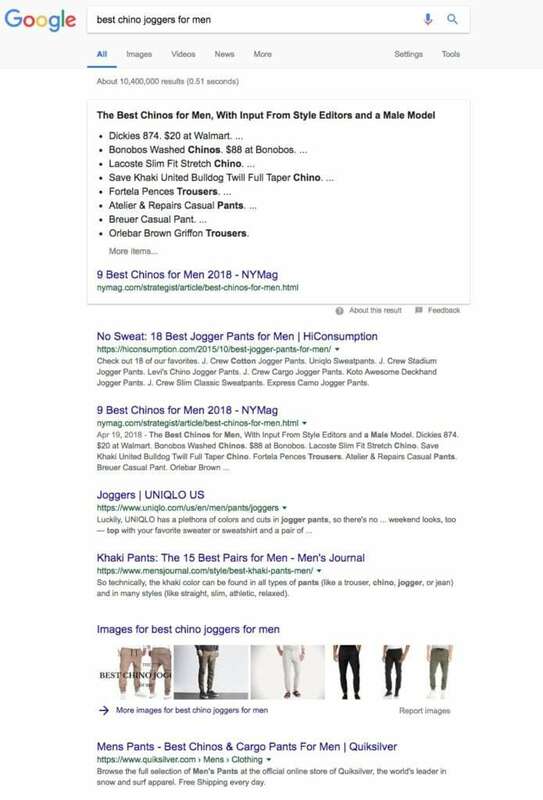 I searched for two “products” – best oatmeal brand and best chino joggers for men. Note the trend of results I got on Google. 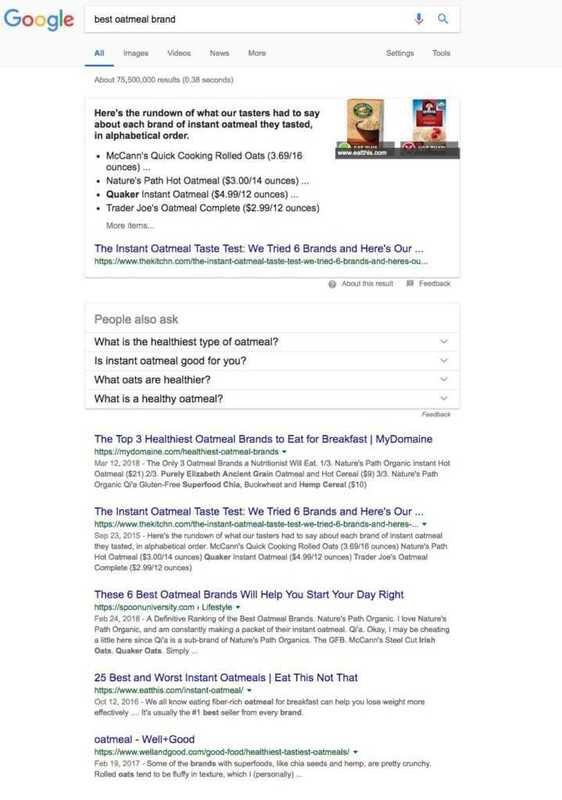 Instead of showing results of products directly, we have results of blogs that have content written about the searched product. This means search engines favor content based results to their researchers. A good content will best describe your product and increase its selling probability. Search engines hold key to the door which allows researchers in the online world. So now that you have learned content is important to sell your product, you need to learn that just content alone does not stand against all the high end rivals in your market. It will fall back in the blink of an eye. In order that your content stays upright, stays strong and becomes visible, it needs to be optimized properly and intelligently. Ranking #1 has become the ultimate goal for websites because number 1 sites get better impressions than what a site at number 2 gets. Search engines closely monitor content so that bad content does not become visible to the researchers because this will harm their user’s experience. Imagine there is an invisible door that keeps the good content on one side and bad content on the other side. What makes your content pass through that door is SEO. When you have a good content and you put good SEO in it, your optimized content is approved easily by search engines and it will become visible to the researchers. Optimized content puts your product in spotlight. If your site SEO is not strong, you will miss out on valued impression. This becomes vital for ecommerce marketing because more impressions means more clicks and more clicks mean more sales. In a totally lay man’s term, If you happen to go street marketing, you will find more customers walking in the shops that are front row. The shops that lie behind have less walk in customers. More walk in customers mean more chances at sales. SEO is the best strategy to place your site on the front where it will be more visible. Look at the above website – Booking.com. It is a travel booking website and does not require a blogs field to it yet, they have blogs that are related to travelling. This content helps them improve in search engine results and researchers will easily be directed towards the site. Most of the websites these days are now trying to have related content on their webpage even if the site itself does not require it. Good content makes for a good reliable brand following. Have you noticed the latest story trends? A few years back, if you wanted a recipe for something, all you got was a straightforward recipe. But the trend has changed to a whole new level. Now you get stories and family event descriptions, the family reaction to that recipe and then finally the recipe. Because now even if you have a good user friendly website that serves the best user experience, what people need more is the depth of information. Just a shot of your product, product name and price are not enough for your online customers. They want to know more. They want to know every little detail to it which makes them feel closer to your product as it has a personal touch. When you put stories and words to your product, it makes a strong fan following. Customers feel attached to your brand and this makes them loyal to your brand. It’s the chicken and egg story all over again. Good content needs good SEO and good SEO needs good content. There is no way either one can win without the help of the other. Your good content needs to be optimized properly in order to get maximum shot at search engine’s traffic. This can be achieved only when you have a great content about your product, promoted perfectly and optimized intelligently. That’s when the magic happen. That’s when customers get pulled in. You first have to sell your product to search engines and from there search engines will help you sell your product by recommending it to researchers. You need to consistently create content worthy of attracting, converting and retaining customers, AND you need to know how to get that content in front of the right people. Optimized content helps you sell your product in the offline world. Today even if we have to buy something from the market, we first read and research about the product online. This goes especially for digital products like mobile phones, laptops, tablets, watches etc. But who are we kidding. Today we would even read reviews online about a brand of shoes or jeans or hand bag before buying it in physical market. Cosmetics market is a totally different game online. People read reviews and product descriptions and celebrities endorsements which make for great sales, both online and physically. So bottom line – content sells your product but SEO helps your content reach out to the prospective audience.